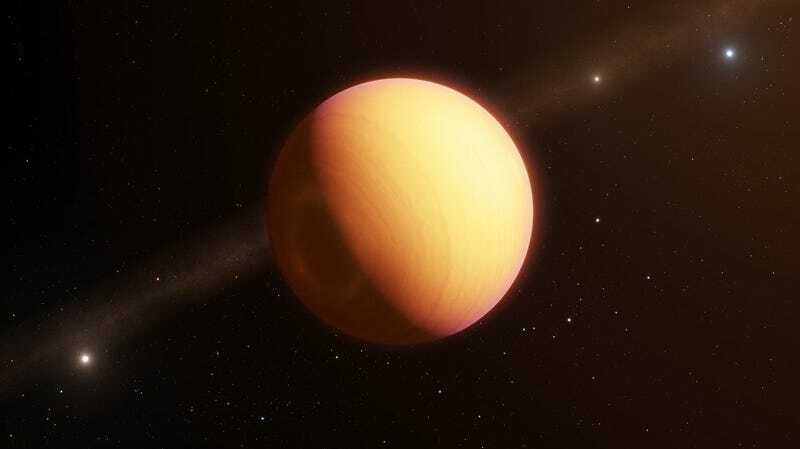 Scientists have directly observed an exoplanet in a whole new way, thanks to an instrument on the European Southern Observatory’s Very Large Telescope Interferometer. Telescopes are more than just lenses and mirrors—they’re advanced electromagnetic radiation detectors designed to overcome the many challenges of observing very distant objects. Exoplanets prove especially difficult to image, as they’re thousands of times dimmer than the stars they orbit. The new kind of observation using optical interferometry with the GRAVITY instrument is another important tool, as it can measure the light from exoplanets directly, rather than based on how they change the light from the stars they orbit. The researchers observed HR 8799e, a young Jupiter-like exoplanet orbiting a bright star called HR 8799, 39.4 parsecs (128.5 light-years) away. It’s not a newly discovered exoplanet, but this is the first time scientists were able to observe any exoplanet using optical interferometry. Their results are published in Astronomy and Astrophysics. HR 8799 directly imaged by the VLT (but not using Optical Interferometry). Optical interferometry is similar to other forms of interferometry we occasionally write about. Researchers took simultaneous visible light observations using the four 8-meter Very Large Telescope units in Chile and lined the observations up later. It’s similar to building a larger mirror to collect light at a central camera, but rather than mirrors reflecting the light in one place, it’s physically bringing together light from four different telescopes thanks to the GRAVITY instrument. This is a typical tool in the radio astronomy toolbox, but making these measurements in the optical light spectrum can help researchers gather more information. “It brings better-accuracy measurements in the position of the planet, and it brings better knowledge of the planet’s spectra,” meaning the colors of light emitted that help researchers determine what materials are in the planet’s atmosphere, said Lacour. The results presented some surprises: HR 8799e contains more carbon monoxide than methane, which was unexpected based on chemistry calculations. Lacour told Gizmodo that perhaps vertical winds on the planet were preventing methane-forming chemical reactions from occurring. A few notes: No, this doesn’t mean that we can now directly image an exoplanet’s optical light, as this method doesn’t produce pretty images, but rather takes data in a sort of mathematically transformed spectrum. “It’s not nice to show,” Lacour said. Additionally, we do not yet have the observational ability to hunt for biosignatures, signs that life have altered a planet’s atmosphere, though it’s unlikely that a Jupiter-like planet would contain such signatures, anyway. Still, it’s an exciting observation for the team—a new tool with which to observe exoplanets, one that could potentially lead to important new discoveries. Astronomers Wonder: Can Moons Have Moons?